The waltz is a beautiful dance that is rich in history. It is characterized by elegant “rise and fall” technique, romantic turns and swinging body actions. The origin of the word waltz comes from the German word walzen which means to turn, roll or glide, which concisely captures the steps and positions of the waltz. This gliding motion you might be imagining for the waltz was not initially smooth and graceful, but performed in a relatively fast-manner. Interestingly, the waltz’s debut was not as smooth as its steps; rather many dancers across the world did not initially embrace the waltz, thus further coloring this dance’s unique and rich history. Today, though, the waltz is not only appreciated by countless people, it is one of the core dances in the standard and smooth division for ballroom dancing; and is enjoyed by many enthusiasts at social events. A predecessor to the waltz is known as Ländler (Austrian folk dance); and was frequently enjoyed in Bohemia and Austria. Many of us may be unknowingly aware of the Ländler since it was featured in the musical, The Sound of Music. These two dances share the ¾ time, however differ in movement. Unlike the waltz, the Ländler is characterized by dancers hopping, stomping, and spinning; however, the waltz does resemble the hopping motion by the rise and fall motions seen in the dance. One of the first recorded instances of the waltz dates back to the 16th century, which was noted by the French philosopher Montaigne. The French philosopher noticed a couple dancing, but the remarkable thing about the way the couple was dancing was how their faces were touching. Before the middle 1500s, it was unheard of for couples to be doing anything more than to clasp hands while dancing. Avid dancers (i.e. socialites) from this time period actually viewed the waltz as unfavorable and godless. As a result, the pioneers of the waltz primarily consisted of countrymen and countrywomen. The waltz’s influence remained relatively subtle but grew in popularity in the 19th century. In the early 1800s, more and more Europeans were waltzing with each other. While many Europeans enjoyed this lively and fast dance, aristocrats did not. Aristocratic dancers were still vehemently opposed to the idea of a couple dancing so close together. They viewed the quick turns as being immoral, even scandalous. Despite all these negative emotions about the waltz, its popularity continued to surge. 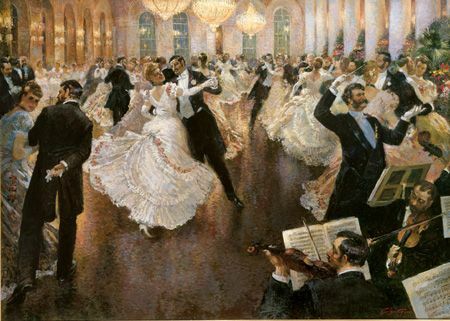 By the 1850s, the waltz had spread to Germany and France. History shows that the French waltzed when their soldiers returned home from war. Records also show that the waltz’s popularity stretched over seas and finally reached the United States. Towards the end of the 19th century, the waltz experienced a shift such that the dancers slowed down and the dance took on a more graceful appearance; yet, the ¾ time remained. However, a faster version of the waltz survived this change of pace, which is known as the Viennese Waltz. While aristocrats around the globe initially regarded and opposed the waltz as a seemingly scandalous dance, a majority of their attitudes gradually shifted during the 20th century. Similar to the 1800s, the 1990s show an increase in the waltz’s popularity, especially in the United States. In fact, when Americans hosted social gathers, such as balls, attendees would expect and eagerly await to dance the waltz. At this point in history, many people considered the waltz as both classy and beautiful. While the origins of these variations are distinct, it has not hindered its world-wide popularity. In fact, some of these waltzes are more popular than where the dance had originated. For example, the international waltz is popular in Poland and the Czech Republic. 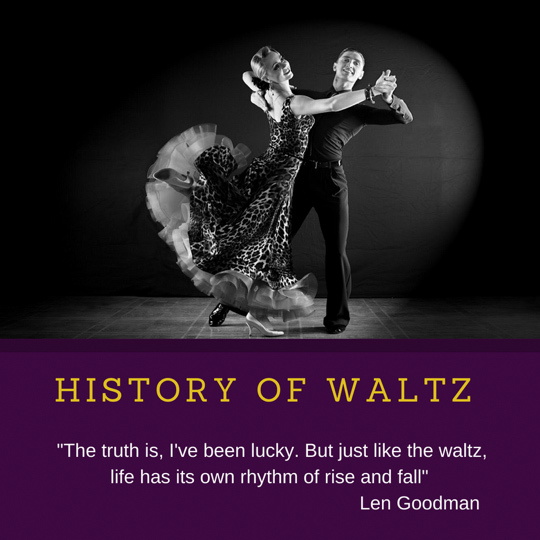 Another influence that has contributed to the waltz’s popularity and colorful history is the rise of dancing programs, such as Dancing with the Stars and So You Think You Can Dance? Altogether, the waltz continues to flourish and its history is ever enriched. The basic waltz steps follow this pattern: step, glide, step in ¾ time. Partners dancing a waltz keep their shoulders parallel to the floor instead of vertical. In the waltz, dancers take longer strides and steps in the dance. Moreover, performers lead with their heel on the forward steps and toe leads on the steps to the back and side. There are many styles we see in waltz created during 19th & 20th century. The waltz is both danced and used to compete in both American style and International style of ballroom dancing, socially American Style Waltz is more popular and opted style. In American style ballroom dancing, Waltz is considered a “smooth” dance along with Tango, Viennese Waltz, and Foxtrot. Waltz in American Style ballroom dance is done in both open and closed dance positions so that the dancers are free to separate from one another. An example of a move that is done as an open dance figure in American Waltz is the syncopated side-by-side with spin. This move includes a free spin for both partners. The Open Roll is another figure that involves open frame that won’t be found in International style Waltz. In this move, the follower alternates between the leads left and right sides with the leads left arm or right arm providing the lead. The Waltz became the staple of many American films and musicals including “Waltz in Swing Time” which was sung by Fred Astaire in 1936.
International style dancing is danced is closed position for all the standard dances. Waltz is considered a “standard” dance alongside Tango, Viennese Waltz, Foxtrot, and Quickstep. 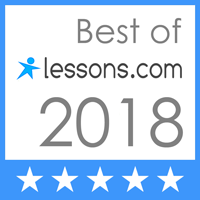 If you want to show off your waltzing skills or practice more often, the obvious answer is to take waltz lessons at Lake Shore Dance Academy (call us for New Student discount!). Not only can you learn the dance with us, but you can hone your skills and even train to compete! Wondering what kinds of songs you can waltz to? Though classical music is a common choice, there are also modern tunes you can waltz to. Especially if you want to waltz at your wedding, or if you simply want to practice your new waltz moves you may want to check out these romantic and popular songs for the waltz. With some old and new music on the playlist, there are plenty of waltz songs to get you and your guests on the dance floor. Ready to show your elegant side and start waltzing? Hint: If you’re engaged, now is the time! We are proudly serving wedding dance couples from Lake Shore area, including Evanston, Wilmette, Winnetka, Glencoe, Kenilworth, Highland Park, Lake Forest, Libertyville and more! Get your free waltz lesson today and we’ll get you moving in no time! For more information about Dances We Teach check out our other pages! Ballroom Dancing in an inspiration to many artist. The beautiful paining from beginning of 20th century “The Last Waltz” by Vladimir Pervuninsky.